liveBooks recently created a partnership with ImageSpan, so I have been learning a lot about the company and what they do. 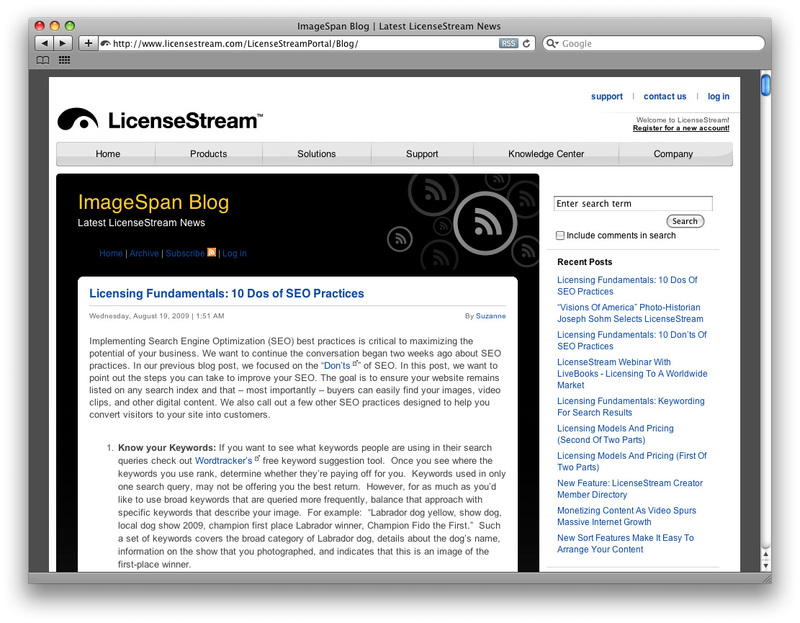 Aside from providing photographers with LicenseStream, a web-based service to easily license their images online, ImageSpan also has an informative blog, which includes tips that can help any photographer optimize their online presence. I particularly like these “don’ts” for search engine optimization, many of which are “dos” taken too far. More images than ever are found through search engines like Google. These tips can help your work rise to the top of the page. I’ve included the first five. See ImageSpan’s blog for all ten. The following are ten things “not” to do to ensure your website remains listed on any search index and, most importantly, to ensure that people can find your work through search engines. 1. Keyword Stuffing: If you use the same keyword repeatedly within your website’s text or in your keyword tags, you’ll find yourself penalized and likely removed from the search results index. How much repetition is too much? Use a keyword density checker to make sure that you’re not over the legal limit. Experts say 3-7% for your major keywords and 1-2% for your minor keywords. We touched on this in our last blog post about keywording, Licensing Fundamentals: Keywording for Search Results. 2. Duplicate Content: Duplicate content deliberately tries to trick search engines into improving a website’s ranking. Search Engines have built-in algorithms that analyze pages with similar content. How much similarity are they looking for? Use this duplicate content tool to see if your pages duplicate too much information. If so, the search engines may omit your web pages or site from the search index. A good place to read more on duplicate content is the Google Webmaster Central Blog. If you need to see a more visual presentation on the subject, check out the blog posted by SEOMOZ.org. 3. Free-For-All Link Exchange Programs: There is a difference between natural link building and free-for-all link exchange programs. With natural link building, you’re linking to relevant sites or reciprocating links with partners or associations. Free-for-all linking occurs when you use software to put your links out to hundreds of thousands of sites. Free-for-all programs are essentially spam, and if a search engine discovers this practice, they will likely penalize your website and lower your ranking (if not blacklist you). Stay honest — start a link-building program by establishing reciprocal links with relevant, reputable websites. It really is that simple. If you’d like a good online resource to learn more about this, check out this blog by SEOMOZ.org on link building. 4. Robots: Do not use a robot to rewrite your content. Such robots alter content just enough to generate a set of new, duplicate pages for search engine indexing, with the ultimate goal of increasing your search engine ranking. You may be seduced by the offer of having your website rewritten for you. Don’t fall for it. Such robots, or programs, typically rewrite your content with very few changes. If you’re caught with duplicate content, your search ranking is likely to plummet so far that no one will ever find it. Needless to say, if you use the LicenseStream HTML code to publicize your store on your blog or personal website, don’t submit it for a robot to rewrite — not only will it affect search engine rankings for your personal website, but it could also affect rankings for your LicenseStream store. 5. Keyword Dilution: Focus on the main keywords that pay off for your online content. To get an idea of what keywords people are looking for, use the free service from Wordtracker. Plug in your keywords and see how many searches they have initiated. Focus the copy on your website and each page on a specific theme. This will naturally ensure your keywords are specific to the types of content and images that someone can find at your website. You may want to refer to the previous ImageSpan blog post about keywording practices. For all ten tips and other helpful information, check out ImageSpan’s blog. Be Part of the RESOLUTION: What techniques do you use to improve search engine ranking for your images? Gene Higa is a destination wedding photographer based in San Francisco, but he’s got great tips for all kinds of photographers. In today’s Tip of the Week, Gene talks about the importance of discovering and distilling your photographic style in order to build a successful brand from it. In a surprising move, Time Inc. has purchased a house in Detroit to serve as a long-term base of operations while its publications document the struggle of the nation’s automobile capital. This seemingly unprecedented move will allow Time’s journalists to cover the story not only as observers, but as part of the community. The iPhone emerged this month as the most popular camera on Flickr, ousting the long-reining top uploader, the Canon Rebel XTi. 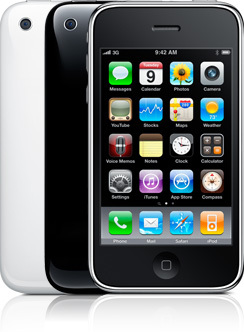 We’re not surprised considering how easy iPhone images are to upload and the improved picture quality of the new 3GS. At the time of writing this post, the XTi has climbed back to the top of the chart, but we’re betting Canon is paying attention and expect to see wi-fi upload capabilities in their DSLRs soon. 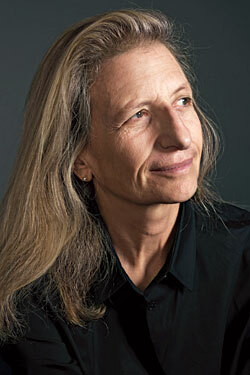 Matt Mandelsohn’s The Lesson of Lindsay is a beautiful story of young girl struggling with personal tragedy. The fact that the piece was turned down by every potential publisher, one because they wanted “happy” news stories, is just a tragedy. A Photo Editor boils it down to the “duh” soundbite that publishers still refuse to listen to.